My name is Dr. Brian Huggins, clinic director at Oakville Chiropractic Centre. 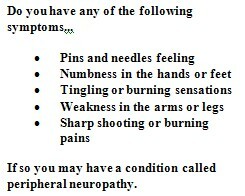 I’ve been helping people with neuropathy and nerve problems for more than 25 years. More than 2 million Canadians suffer from peripheral neuropathy, a problem caused by damage to the nerves that supply your arms and legs. For two weeks $47 will get you all the services I normally charge new patients much much more for! Call today 905 845 2291 and we can get you scheduled for your consultation, exam and x-rays as soon as there’s an opening. Dr Brian D Huggins, D.C.